Rakhi is about celebrating the strongest bond on Earth and to celebrate and honor such relation, there can be no better option than Silk. One of the strongest natural fiber, silk thread Rakhis are lustrous, smooth, and is acclaimed to be filled with celebratory vibes. History affirms that silk dated back to first and second century B.C. This highly desirable fiber was procured via silk routes. As these routes began to expand, trading luxurious silk becomes easier and effortless. These reached countries day by day and soon, the Indian subcontinent was blessed with this miraculous fiber which was safeguarded since long by China. The secrets of silk go back to age-old history where it was perceived as a luxury, an equivalent to gold, precious gems, although it was its opulence that made it reach heights. Preciously procured, the threads were knitted together in order to craft sarees, shawls, an apparel, and soon, its high quality made it into to gifts and invaluable tokens category. And today, it has secured a great position in the rituals of Indian traditions, especially, in the auspicious occasion of Raksha Bandhan. Ideal to celebrate siblinghood, silk is being embroidered into elegant threads. Each of these threads is crafted with one of a kind designs, types, and colors. No matter which type you acquire, each wristband made out of silk is able to retain its softness and luxuriousness. And to tie a knot of strength right at your brother's wrist, there can be no rakhi better than a silk rakhi. Now, you must be wondering how to lay hands on one of these? Well, you don't have to go back to silk routes to get one, as these are easily available at your fingertips via FlowerAura. True to its motto, FlowerAura caters to enrich Raksha Bandhan by providing an extensive range of silk rakhis that are made with precision and can uplift spirits of the occasion profoundly. These silk thread rakhis for brothers are made from the finest silk threads and are preciously crafted in heartwarming designs and types. Thus, if you are seeking for a silk rakhi, FlowerAura is all ready to provide you with a wide range of it along with the holy rakhi puja thalis and sweet delicacies. All you need to do is browse through our online portal and select a silk rakhi from a wide array of Rakhi gifts available and once you've made your choice, couple it with a puja thali, a greeting, and other traditional tokens you would love to celebrate your day with. The delivery will be made via FlowerAura's same-day delivery and midnight delivery option that caters to send Raksha Bandhan gifts via its prompt and quick features. Rakhi or Raksha Bandhan is one of the sacred occasion that celebrates the strongest bonds on Earth. This strongest bond is of nobody but of a brother and a sister. Filled with fights, love, and unforgetful memories, this bond shares an irreplaceable connection and no matter how much they fight, each of them is full of love and affection for each other. Their inner feelings are personified on the pious occasion of Rakhi through their thoughtful gifts and tokens. The sisters wholeheartedly garb themselves up in the Indian attire, decorate the puja thalis, and present the silk thread rakhi they 've procured from FlowerAura. And the brothers go through a long array of Rakhi gifts for each of their sisters. The rituals are then carried out to celebrate their love for each other via unique rakhi tokens and surprises. However, this year your brother is far away and due to his hectic schedule will not be able to come home to celebrate Rakhi with you. Well, there's no need to worry because FlowerAura is all set to send your warm wishes and blessing straight to him. Wondering how? After you make your Rakhi selection, FlowerAura's exclusive services and features avail to send Rakhi and other gifts to all the major and minor cities of India. It caters to deliver to the remotest corners of any IT city and make the occasion for every brother who is residing far away from his sister and vice versa. 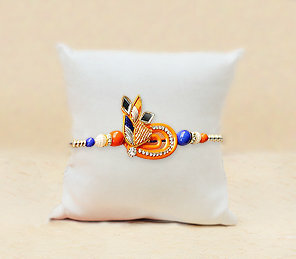 The services include free shipping and avail every customer to send silk rakhis anywhere and everywhere in India. FlowerAura caters to make the occasion grand and special even for the Bhaiya and the Bhabi and their kid. Gracing the Lumba rakhi for Bhabi and cute, adorable Rakhi for kids. These are beautifully adorned in the most trending fashion and FlowerAura caters to even make it special by blessing the rakhis with variant cartoon characters, flowers, and many other prettiest details.